How many of you have been to the Mediterranean? If you lived there you might not have to worry about heart disease. Everybody pack your bags for Sicily (or another beautiful Mediterranean place) so we can all live a long healthy life. Snack Girl has never been there but she has seen it on TV and would love to visit. It seems that people who live in Mediterranean countries have lower rates of heart disease than us here in the USA. Could it be the sunshine? The beaches? How about the raw beauty of these places? I am sure my blood pressure would decrease if it would just stop snowing! Researchers have been trying to tease out the effect of the diet from these countries (which is not easy to do). Guess what? It has to do with olive oil and nuts. Yes! The groups of people at risk for heart disease that ingested at least 4 tablespoons of olive oil per day or one quarter cup of nuts (walnuts, almonds, hazelnuts) with three servings a day of fruits and two servings of vegetables cut their risk of heart attack or stroke. The Mediterranean dieters ate fish three times per week and ate white meat instead of red. They were encouraged to avoid processed meats and baked goods. They even got to drink at least seven glasses of wine per week (with meals)! Did they lose weight? No, they didn’t. But, their diet made a big difference in their risk for heart disease. In our quest for the perfect waistline, we can forget that healthy can be about eating higher calorie foods like extra virgin olive oil and nuts. Our bodies use the fats and nutrients in these foods to maintain important body functions such as our cardiovascular system. The researchers also found that a low fat diet was not easy for participants to maintain and had no effect on heart disease rates. So, stop being afraid of fat. The right fat in the right amounts can be healthier than no fat at all. What do you think of the success of the Mediterranean Diet? Does it change the way you think about food? U.S. News & World Report has taken on the challenge of ranking the best diets for the last three years. How do they do it? Years ago I went on a really low fat diet and ended up having to have my gallbladder removed because of it. Also on Dr. Oz he said to tell that your olive oil is the real thing put it in the freezer. If it freezes it's not pure olive oil. Always buy in dark colored bottles and make sure the olives are harvested where it is grown. I grew up in a large Italian family where the olive oil, greens, nuts, cheese and wine flowed like water. Most of my family lived well into their 80's (87 being the norm) and my maternal grandmother lived to be 95. So yes, I believe in the Mediterranean diet. To us a snack was fruit or cheese no candy unless it was a holiday and company was coming. All the breads and baked goods were homemade (even the pasta). My Nonna made the best cheese & spinach ravioli......Wonderful memories!!! As a long time vegan, I realized I was getting lazy about my protein sources, falling into the habit of turning primarily to soy based products, some of which were of the processed variety. It's as if I'd forgotten about things like beans and nuts and how delicious they are when sauteed up with a bunch of fresh vegetables and some really good olive oil. Just a few weeks into my commitment to be a little more thoughtful about protein variety, and I can already feel the difference in a certain lightness of being. Not to mention a much happier palate! I hear the Mediterranean diet also helps to delay the onset of Alzheimer’s. Anything that is good for the heart is also good for the brain. "The authentic post-World War II Mediterranean diet of Crete--lots of physical labor coupled with lots of fruits, vegetables, legumes, and just a little bit of olive oil, wine, & fish. "Br J Nutr. 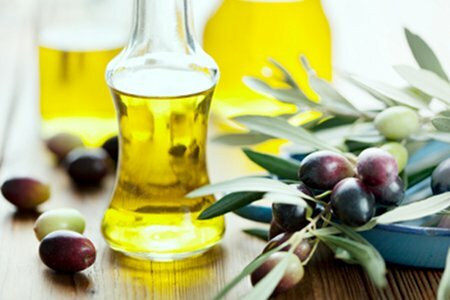 2004--when researchers went back to Crete to look at the health of the islanders 50 years later--the group with the highest olive oil (MUFA) consumption had the highest heart disease, and those with the lowest olive oil intake had the the lowest heart disease. Click here and here for more about why olive oil & the monounsaturated fats aren't exactly health food. "The data on which the Mediterranean Diet is based came from the 1950's. "At that time the people on the Isle of Crete had the lowest all-cause mortality. It was post-WWII, they were poor, didn't have a lot to eat, ate mostly fresh fruits & veggies from their gardens, walked 9 miles a day, worked at hard physical labor and the highest consumption of oil was 3 TBS a day--and small amounts of fish. Big difference from how we live today." Lisa, you asked if the "success of the Mediterranean Diet" changes the way I think about food and it doesn't. I strive to avoid foods that have been processed and while the occasional olive might be okay, squeezing and refining thousands of them so that I can cook with the results is something that doesn't seem good for my body. But I know that bodies are complex and multi-faceted, so if you try (or don't try) the Mediterranean Diet and it improves your health, awesome! I would think their pace of life, and beautiful environment helps too. Dr. Weston Price visited countries all over the world, and found many healthy communities. Some ate lots of red meat, some ate lots of whale blubber, etc. The common factor in all these healthy communities was NO PROCESSED FOODS. I don't think we necessarily needs olive oil and nuts for health (although those are good things!) and I don't think we necessarily need to elimiate red meat (especially if it's grass-fed!!). We, too, could be healthy if we just got rid of highly processed foods. If your choice is olive oil or any other kind of oil, margarine, oleo, sprayed can stuff or squeezed out of a bottle, quess which one is best for you. Oil is drizzled on your food not poured in quantity. You should not be frying anyway. A few tablespoons of oo is like a glass of wine. You down down the whole bottle. By the way, READ MY LIPS, it's the processed food that kills you. I´m glad to read this news! Today olive oil is one of the most popular edible oils worldwide both for its nutritional value as for its high gastronomic qualities. Its high content of unsaturated fatty acids, vitamin E, natural antioxidants and other nutrients make medical science considers as one of the healthiest. Hi, I live in central Portugal, and can tell you food choices here are much simpler, and I think probably more healthy than in the UK, or US. In my village all my neighbours are in their 70's and 80's and are still working on the land, by hand They grow there own produce and keep goats and chickens, for milk and eggs The diet I guess is what could be termed "poor" as they can't afford expensive meats and i swear none of them has ever seen a ready meals but it is very healthy.Lots of vegetables, fruit,and beans, with water and wine to drink . I also think that the fact they are up early every morning and are physically active helps keep them fit in body and mind. They don't stay in doors watching the TV , but spend time out in the sun,wind and on occasions rain. I think these things are also what gives them a healthy lifestyle. I have found since living here that my diet is much healthier, and I feel loads beter for it . Any diet -including the Mediterranean diet- that focuses on unprocessed foods will definitely reduce the risk for heart disease. In fact, you could almost call most junk food or processed food poison when you look at the facts, and what it does to people. Dr. Norm Campbell recently wrote a post on Hypertension TALK titled “Junk Foods,” “Treats,” or “Pathogenic Foods”? I have always considered the caloric values along with buying organic/best quality foods available, basically never over-indulging in high calorie processed foods. This led to more and more whole foods over the years, measuring amounts of fats,cheeses, etc. I don't think using unlimited olive oil sounds healthy. Also I think the 1 wine/day for heart health is a lot of bunk. Wine, alcohol causes more health problems than it helps [like cancers], and the anti oxidants and other good stuff can be gotten from red grapes and green tea. My common sense about olive oil and wine has served me well. I find that people like justifying what they like by finding claims that support them, but it seems new research every year keeps supporting whole foods, not touched by man. So I'll stick with whole foods most of the time, my big treats include cheese couple times per week, homemade desserts, and chocolate for special occasions. [and no more than 1-2 tbsp evoo daily if any]. Great subject, comments and recommended sites! Thanks again, SG!! Dr. Dean Ornish basically points out that this study (and headlines referencing it) *did not* compare a Mediterranean diet to a low-fat diet; rather, it compared a Mediterranean diet to the control group's "advice to reduce dietary fat" which the study authors admit resulted in an insignificant decrease in dietary fat intake (from 39% to 37%). - Rich in fruits, vegetables, whole grains, legumes, and soy products in their natural, unrefined forms. - Low in total fat (<10 percent fat), saturated fats, and trans fats. - High in omega‑3 fatty acids (fish oil, flax oil, salmon). - Low in refined carbohydrates such as sugar, white flour (bread, pasta), white rice, and sugar-sweetened beverages. - Low in processed and refined foods. It seems to me that the "study" which we're discussing was a little heavy on sensational reporting (and don't think that the NEJM is immune to that pull!) and a little light on meaningful. That said, if you're following a Mediterranean diet and it's helping you get/stay healthy, you're doing better than those on the Standard American Diet! hey Andy, Thanks as always for your comments; I've been reading the ''happyhealthylonglife.com'' site for days! Its easy to know how to eat but then unwittingly eat something junky now and then. Must be constantly vigilant. So many of these studies are bits of truths, confusing, contradicting, and I do believe the food industry is laughing all the way to the bank! [http://www.nytimes.com/2013/02/24/magazine/the-extraordinary-science-of-junk-food.html?pagewanted=all&_r=1&] Keeping up with what our bodies need, eating whole foods as much as possible, with some supplements, seems to me the easiest way to get thru each day. Anyhow I'll be watching my omega 3's more closely now thanks to that great site. Thank you SG for the interesting topics and sharing of knowledge by all! @Barb L- that's a great article you linked to, thanks. "In the process of product optimization, food engineers alter a litany of variables with the sole intent of finding the most perfect version (or versions) of a product. Ordinary consumers[']... opinions are dumped into a computer, and the data are sifted and sorted through a statistical method called conjoint analysis, which determines what features will be most attractive to consumers." "When I asked Geoffrey Bible, former C.E.O. of Philip Morris, about this shift toward more salt, sugar and fat in meals for kids, he smiled and noted that even in its earliest incarnation, Lunchables was held up for criticism. 'One article said something like, 'If you take Lunchables apart, the most healthy item in it is the napkin.''" "...a team of scientists that found that people could beat their salt habits simply by refraining from salty foods long enough for their taste buds to return to a normal level of sensitivity." "But the one [attribute] he focused on most was the [Cheetos] puff's uncanny ability to melt in the mouth. "It’s called vanishing caloric density," Witherly said. "If something melts down quickly, your brain thinks that there’s no calories in it . . . you can just keep eating it forever." "...the largest weight-inducing food was the potato chip. The coating of salt, the fat content that rewards the brain with instant feelings of pleasure, the sugar that exists not as an additive but in the starch of the potato itself — all of this combines to make it the perfect addictive food. "The starch is readily absorbed," Eric Rimm, an associate professor of epidemiology and nutrition at the Harvard School of Public Health and one of the study's authors, told me. "More quickly even than a similar amount of sugar. The starch, in turn, causes the glucose levels in the blood to spike" — which can result in a craving for more." "Sanger was trying to say, 'Look, we're not going to screw around with the company jewels here and change the formulations because a bunch of guys in white coats are worried about obesity.'" While I'm not a fan of government intervention/regulation, I think that attitudes (and comments) like Sanger's will bring on legislation that he and his peers could have staved off had they been more receptive to the idea of adopting a proactive stance back in April of 1999. Me, I think the problem is on the demand side, not the supply side. If consumers chose to stop buying this (pardon my French) crap, it will die a rightful death.